Terri B. - I was so happy to find that hardback Rules of Civility - that was my favorite find of the evening! Looks like a nice set of books and they seem to be in very good condition too! Harvee - Almost all of them were in pristine condition - an important consideration for me! Man, you won the lottery. They are all excellent choices! Sandy - I sure did, thanks! Sam - I can't wait to get started! What a great haul! Enjoy your books! I'm very impressed, considering you only had 30 minutes - and also slightly envious. Gold medal for you, JoAnn! Good choices. I read at least three, and see two of my wishlist in your possession. Loved I Captured the Castle. What a sweet book. Thanks, Brenda. I'm hoping one of my daughters will read I Capture the Castle as long as it's here on the shelf. What a great haul! I loved I Capture the Castle, The Lotus Eaters, and The Postmistress - all great reads. Carrie - My mother just borrowed The Postmistress today, so I'll have to wait a little longer, but I'm really looking forward to The Lotus Eaters! Yes, great 'loot'! I've a few of these and have read some. But one book I think is particularly timely, that's Nora Ephron's I Remember Nothing. I read it when it came out a year or so ago and quite enjoyed it. The lady was a great talent. Just so sad she passed away so young, relatively, at 71. Arti - Her passing at such a young age was very sad and, no doubt, behind my purchase of the book. Hope it's as good as I Feel Bad ABout My Neck! You certainly did well in just thirty minutes! Love Richard Russo. Didn't know he wrote short stories though! Ti - I think this is his first (and only) collection. Ahhh, the only one of these I have read is also the one you have already read -- Rules of Civility. Which I also loved. So I can't say anything about these others but WOW -- they all look so good. This is a great haul! Cipriano - Rules of Civility will probably end up being one of my favorites this year. I hope Amor Towles is busy working on another book - I will read anything he writes! We're reading The Rules of Civility in the library's book group next month. Can't wait. Karen K. - My guess is that you will love it. The writing is superb! So many wonderful books! I especially recommend Mudbound and Striped Pyjamas, but many of the others are great too. Enjoy! Thanks, Jackie. I know I'm going to enjoy both Mudbound and Striped Pajamas - they both sound like good discussion books, too. What wonderful books! 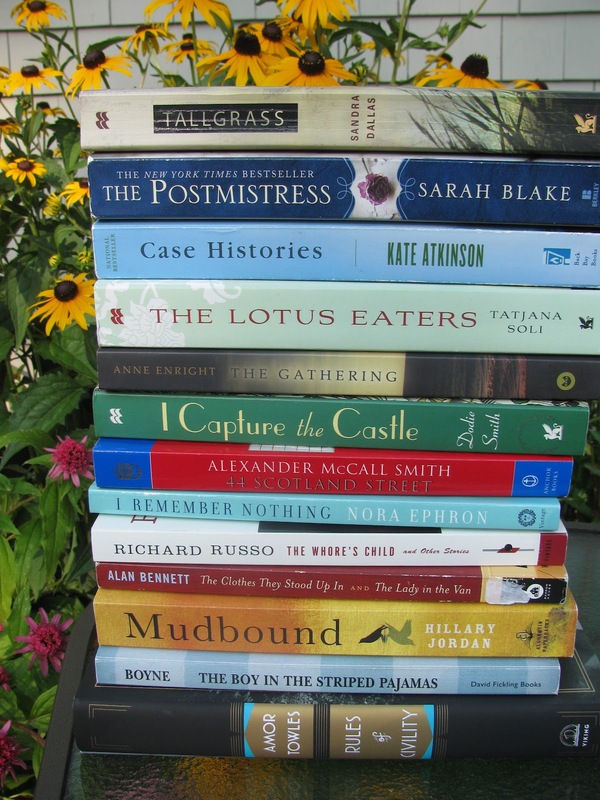 I particularly enjoyed The Lotus Eaters, and I have many of those titles on my TBR too! Nomadreader - I'm so glad to hear you enjoyed The Lotus Eaters! It will probably end up being a read/listen combo now that I have both available... almost like a total immersion experience! Yay to that edition of I Capture the Castle! I read and re-read this book to spend time in the company of Rose and Cassandra and Topaz. I hope you enjoy it. Vintage Reading - I loved I Capture the Castle and can't wait for my next reread. So glad to have my own copy! I loved The Postmistress! I haven't read The Gathering by Anne Enright (it's on the shelf) but I did read a collection of her short stories which I liked. Booksnyc -The Postmistress comes up over and over again as a book club selection. I'm glad to hear you loved it - I'm pretty sure I will, too! What a great list. Enjoy!! Carol - I know I will... just need to decide where to start! Wow. Nice haul! I loved Mudbound and The Postmistress. I Remember Nothing is quite good, too. I think I liked I Feel Bad About My Neck more, though. Have to check my reviews. I listened to Tallgrass and enjoyed it, but didn't care for The Boy in Striped Pajamas. Lee - Case Histories is a book everyone seems to love. I can;t wait to read it! My niece raves about I Capture the Castle. One of these days I'll have to read that one. You got some great books, Joanne. A very successful sale! Thanks, Kaye. I always find great treasures at our library sale! Staci - I thought of you when I made that purchase! My parents were here for dinner yesterday and my mother took Tallgrass home to read this week. You really got some great books!